Viktor Yanukovych has staged a remarkable comeback - recovering from humiliation and disgrace in Ukraine's election of 2004, to win the presidency at his next attempt. He has been confirmed the winner of the 2010 election by the electoral authorities, in a vote declared by international observers to be an impressive display of democracy, with no significant flaws. He won by 3.48% over Yulia Tymoshenko, the prime minister, who refused to accept the result, alleging fraud. It is a far cry from 2004, when he was declared the official winner but, following huge protests on the streets of Kiev - the Orange Revolution - his victory was ruled fraudulent and annulled by the Supreme Court. The re-run was won by Viktor Yushchenko. In 2004 Mr Yanukovych was seen as outgoing President Leonid Kuchma's protege - identified with an unpopular administration accused of corruption and economic mismanagement. He also had the open support of Vladimir Putin, who was Russia's president at the time. 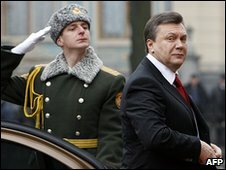 Nowadays, Mr Yanukovych is trying hard to shed the image of being "Moscow's man". Although the Kremlin was clearly pleased with his election, he pointedly made his first foreign trip as president to Brussels, rather than Moscow. He recently told the BBC that much had changed since 2004. "I remain committed to a balanced policy, which will protect our national interests both on our eastern border - I mean with Russia - and of course with the European Union," he said. "Ukraine's integration with the EU remains our strategic aim." While his party wants to restore close ties with Russia - ties that were strained by the pro-Western liberal policies pursued by Mr Yushchenko and his team - it also wants more powers devolved to the regions. His strongest support is in the east and the south of Ukraine - Donetsk, Kharkiv, Luhansk and Crimea. Born into the family of a metalworker and a nurse in the eastern town of Yenakiyevo in July 1950, Mr Yanukovych had a troubled childhood. He was twice jailed for violent crimes in his youth - though his official biography states that his convictions were eventually quashed. "I came from a very poor family and my main dream in life was to break out of this poverty," he once told journalists. Beginning his career as a transport executive in the Soviet Union's key coal-mining industry in eastern Ukraine, he became a Doctor of Economics - the equivalent of a PhD - in 2000. He became governor of the Donetsk region, home to more than three million people and the economic powerhouse of Ukraine, less than a year after entering the local administration. Some see him as the figurehead of Donetsk's political and business groups and associate him with local oligarch Rinat Akhmetov. Supporters say Donetsk secured unprecedented levels of investment during his governorship. Former President Leonid Kuchma appointed him prime minister in November 2002. 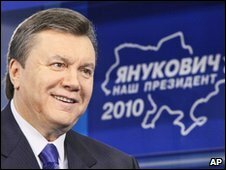 Although he learned Ukrainian after taking office, Mr Yanukovych often finds it difficult to express himself in literary Ukrainian and switches to Russian when dealing with difficult subjects. Mr Yanukovych's opponents have often made fun of his appearance - he is almost two metres tall (6ft 6ins) and is reported to weigh at least 110kg (240lb). He has often played up his stature, and stressed his manly skills as a parachutist and a pilot. Given this, he was widely ridiculed after the 2004 "egg incident" in Ivano-Frankivsk, when an opposition activist threw an egg at him in public. Mr Yanukovych collapsed to the ground, groaning and clutching his chest. 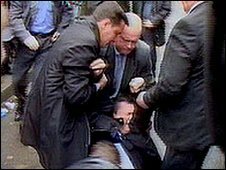 Initially taken to hospital and put in intensive care, he recovered within hours and went on television to say he felt sorry for the "wayward" youngster who had thrown the egg.